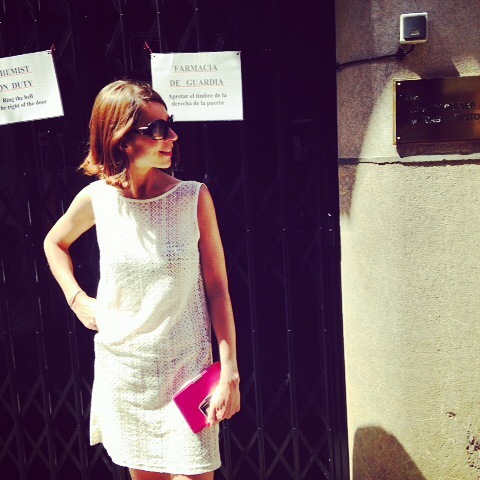 ‘I just want to walk into a hotel lobby and be anonymous,’ grumbled the husband. We are on the penultimate day of our holiday in Sóller, Majorca. And the owner of the little boutique hotel where we are staying seems to be taking an overly-keen interest in our movements. Everytime we walk past reception, he collars the husband to rhapsodize about the weather, England, the weather again, the restaurant we are planning on going to, even the clothes he is wearing. The owner – Matthew – is actually a very nice man. But his very hands-on approach to hoteliering is making the husband on edge. Despite the beautiful room here, we have begun to long for the relative relaxation and anonymity of the finca in the hills, where we resided for the first part of our stay. The owner Marc might have had a fixation with serving gallons of coffee at breakfast and an over-inflated sense of what his bottles of diminutive water were worth, but because he was slightly autistic he left us largely to our own devices. Before we left the finca, we also developed a mild obsession with a gravelly-voiced waiter there, who we fondly named Barry White. Barry had a most intriguing, soothing croon, as he cleared the table and served our food. I tried to get a bit of video footage of his strange baritone rumble but I’m not sure it does him justice. 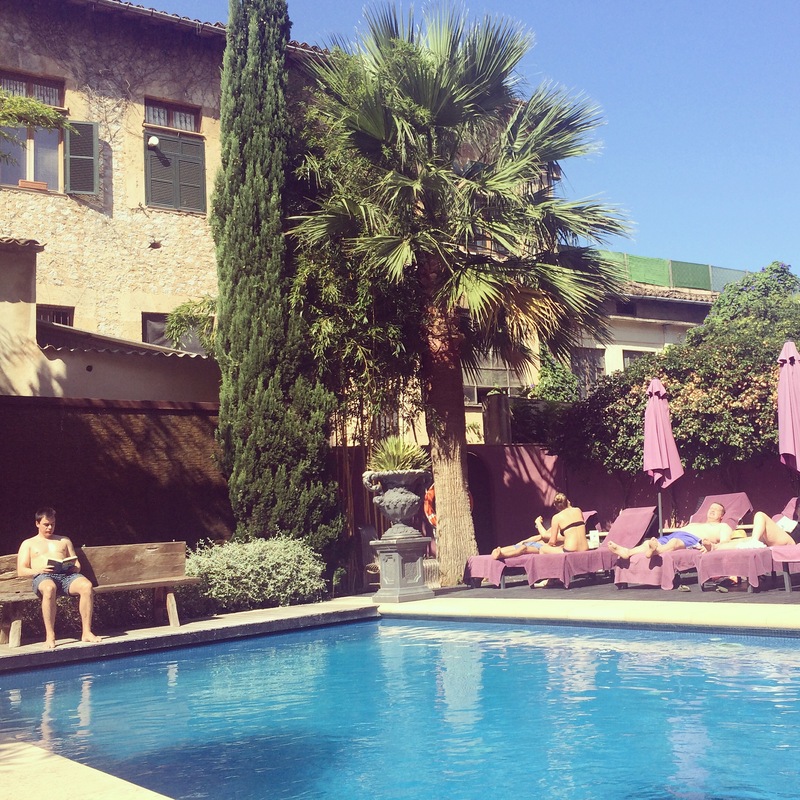 Back in Sóller, I have developed hives. My skin has a tendency to go berserk when faced with too much sun, stress, the wrong food, wrong washing powder – or over-earnest hoteliers. I spent three days itching myself to madness before seeking help. Luckily, there is a little old lady up the road who may or may not be masquerading as a pharmacist. To attract her attention, you need to ring a bell and she appears from behind a grill to deal with one’s ailments. We asked for some anti-histamines; she disappeared for a while and then a little hand shot out to hand over the medication and take our money. It was ace. We became so taken with the little old lady that we have been trying to think up new illnesses – just so we can visit her again. Here I am next to her metal grill and buzzer. When passing tourists saw me having my picture taken, they started snapping away too, convinced the hidden pharmacy was some sort of historic attraction. 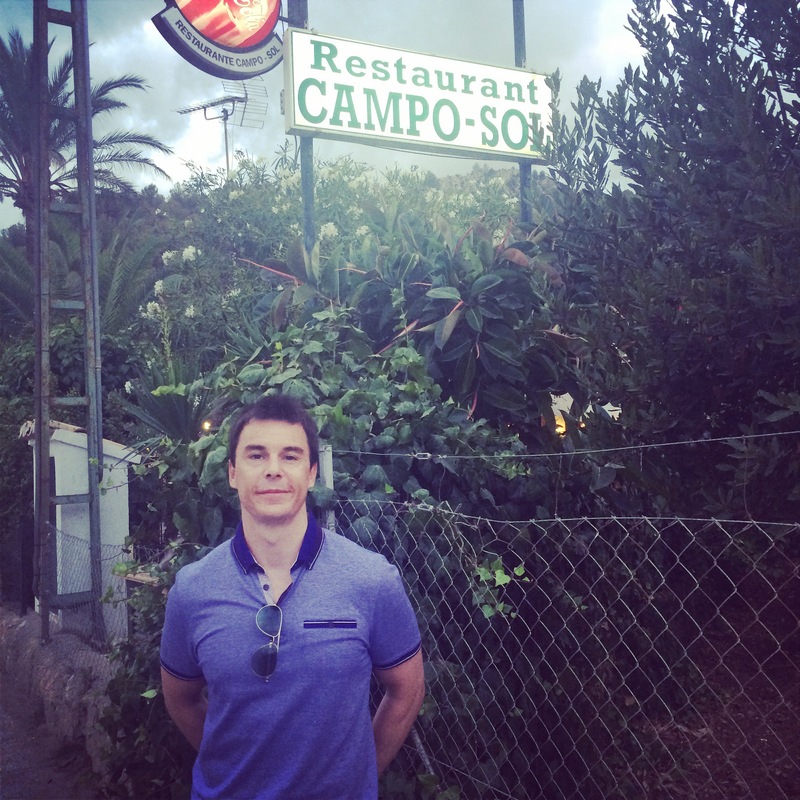 Over in Puerto de Sóller, we attempted to dine at one of the restaurants my coffee shop friend Malcolm recommended. It was full. I don’t have the heart to tell Malcolm we didn’t end up eating there so I have memorised the menu (‘the rabbit and onions was sublime!’) and snapped the husband posing outside, as photographic proof of our visit. The sunbed situation at the current hotel isn’t quite the all-out battle to bag the best bed of previous years. Instead, there’s more underground tactics at work. Put simply, the pool area is quite small and only about four sunbeds get the sun past 4pm. This means that there’s a secret bed-hopping war at play, in an attempt to secure the best beds at different stages of the day. As a seasoned sunbed bagger, I’m on it. But at 4pm, people all begin to drag their sunbeds towards the dying rays, creating a sardine-like squash in one corner of the pool (spot the lonesome husband!). 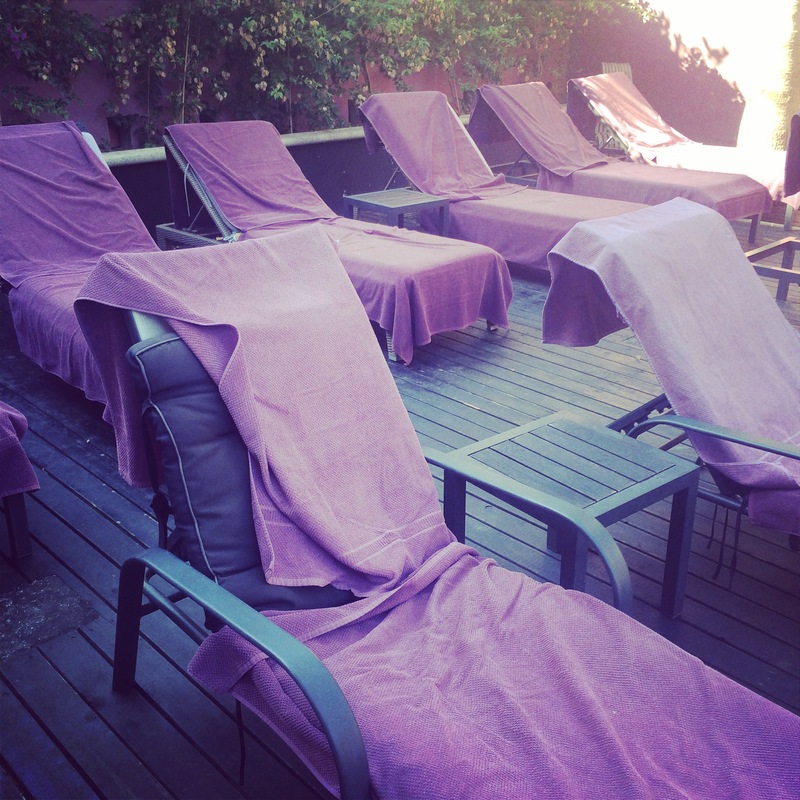 Owner Matthew prides himself on setting out purple towels throughout the whole pool area (he told us this in great detail) so it’s difficult to ascertain which beds are in use or have been used, having to rely a rudimentary towel ‘crumple test’. It did make me wonder how Matthew knew which towels to change at the end of the day. It was only on Day 2 of our stay here that I uncovered a startling revelation: Matthew DOESN’T change the towels! Unbeknown to him, I was stealthily spying on Matthew from the behind my copy of Donna Tartt’s The Goldfinch, as the last vestiges of the vermillion sun dipped behind the mountains. Rather than whipping the used towels off the loungers, he merely smoothed them out with a deft flick of the hand. This means that right now, I am probably lying in the sweat of that meaty man from Room 3. When we returned from lunch today, chomping on ice creams, jittery Matthew was grinning expectantly from behind his reception desk. ‘I just want to eat my ice-cream in peace,’ muttered the husband, as we returned to our squashed and sweaty sunbeds. Yep, it’s one of those white fluffy things that you use to lather shower gel around your body. The problem is that no one really knows what to call it. To the husband it is quite simply a ‘shower puff’. I’ve always called it a puff too. But I’m not sure what its official title is. I’ve heard it labelled a variety of things: shower scrunchie, body polisher, even a shower flower. I once saw a besuited man in Boots attempting to explain to the shop assistant what he was looking for. 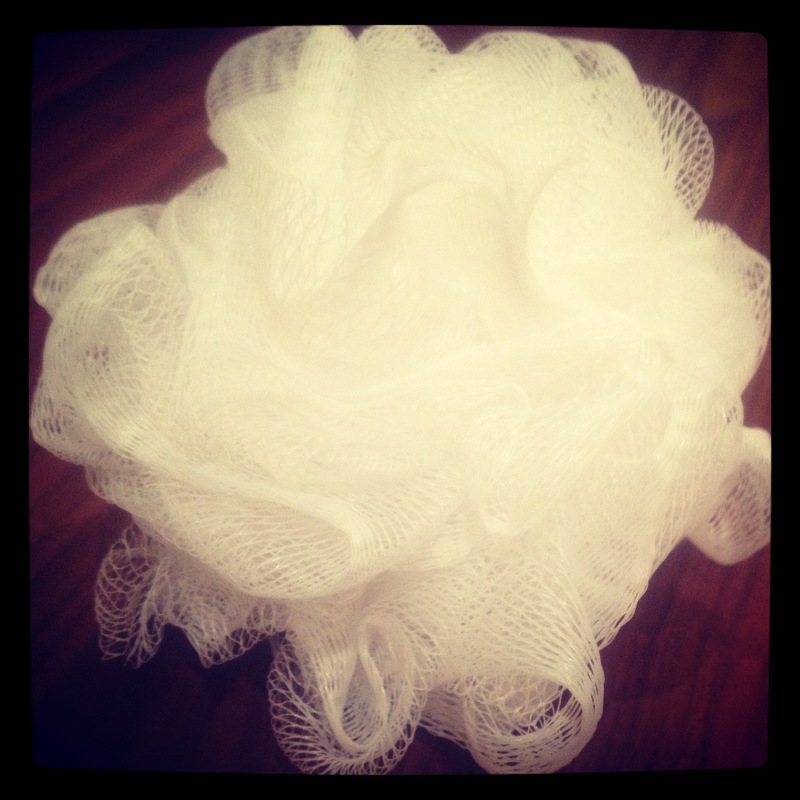 ‘It’s a white fluffy shower… thing,’ he was saying, whilst doing a circular scrubbing motion with his hands. ‘A puff?’ I helpfully chipped in. 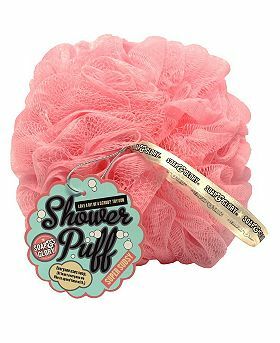 Anyone who doesn’t use a shower puff for everyday cleansing really is missing a trick. I mean how else do you get up the kind of lather that a puff can provide? We have a variety of puffs in our house, including a large pink puff, which I acquired from Soap and Glory. It’s huge, and bills itself as the ‘best latherer in town’. I even bought my mother-in-law one for Christmas (turns out she loves puffs too!). For day-to-day showering, we plump for a simple white Boots puff (one each, of course – I’m not sure on the etiquette of a shared puff). Boots provide the best puffs; those puffs purchased from Superdrug et al. have proved feeble, and begin to unravel when faced with a vigorous scour. The husband went on a business trip to Latvia the other week (where he got trapped in the a toilet cubicle on his way to a business meeting and had to wait half an hour for the hotel maintenance team to remove the hinges off the door. During this lavatory-based debacle, the meek Saudi man, who the husband was supposed to be meeting, was waiting on the other side of the door to greet him, arms outstretched… But that’s another story). Being the loving wife that I am, I often leave the husband a range of silly notes when he goes away – sometimes in a pocket; sometimes in a shoe. More often than not, he doesn’t even notice them. I once popped one in his packed lunch and he accidentally ate it. For the Latvian trip, I popped a note in with his ‘travel puff’ (travel puff lives in a clear white plastic zip up bag; he’s a slightly smaller version of your standard puff). Upon arrival, the husband – being the most unobservant man on this planet – removed trusty travel puff from his suitcase and was happily scrubbing away in the shower, whilst unbeknown to him my ‘Puff Daddy’ note had somehow ended up lying on the floor of the shower cubicle unnoticed. This would have been fine, had the husband not been sharing a room with his work colleague. 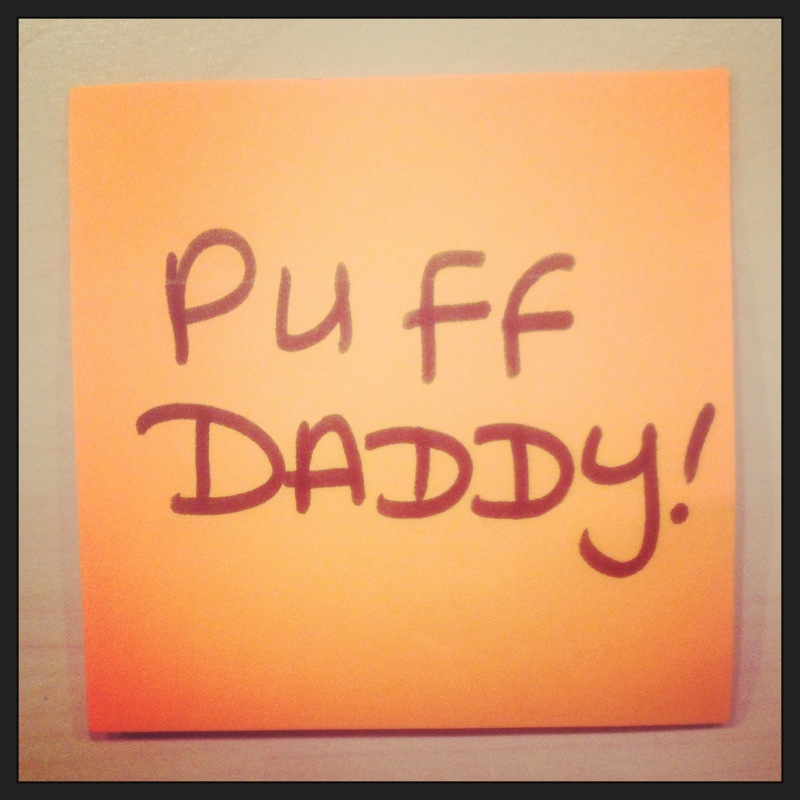 Said work colleague then entered the bathroom – and staring back at him on the floor was a bright orange Post-It note that simply said ‘Puff’ (the ‘Daddy’ part being unfortunately folded underneath). The husband isn’t sure whether or not he actually spotted the offending note. But I like to imagine the work colleague spending his shower in complete and utter confusion, possibly muttering, ‘PUFF? ?’ to himself several times, as he lathered away. The annual Great Summer Holiday Hunt began in earnest about two months ago. First, there was the decision of where to go (France/ Italy/ Greece/ Bognor Regis…). Next, was choosing a hotel (not too big, not too small, sizeable pool area, walking distance of a restaurants, preferably nestling alongside a picturesque harbour with postcard-perfect houses in pastel colours artfully positioned on the hillside – I don’t ask for much) and thirdly: Can it live up to our favourite hotel? 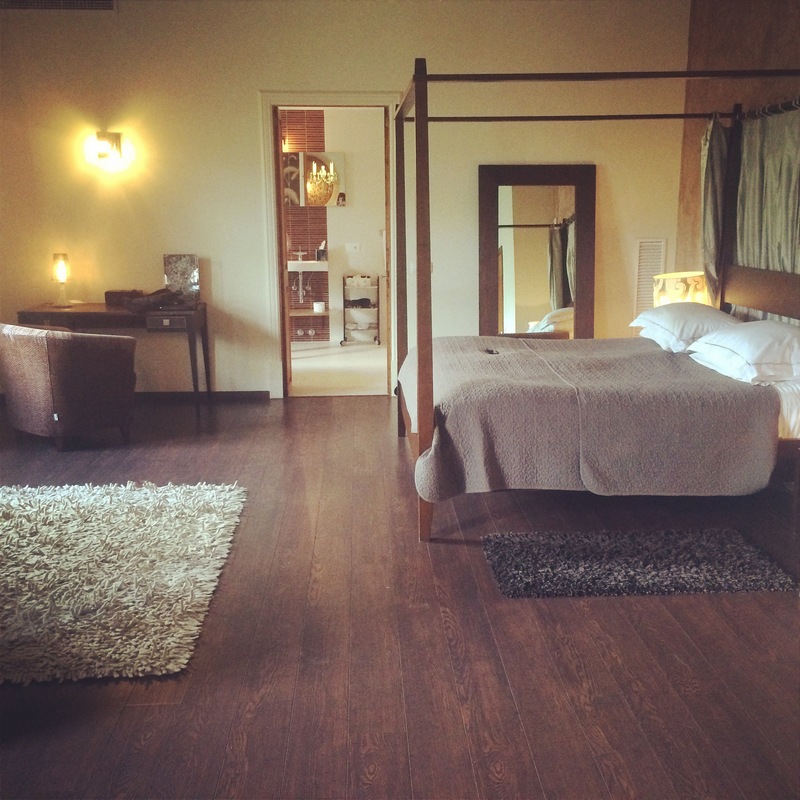 The problem with finding a hotel that you love is that you start comparing all other hotels to it – and sometimes they just don’t live up to the benchmark. Last year, we went to Lindos Blu in Rhodes. In my mind it was the perfect hotel, pitching itself somewhere between boutique and medium-sized, offering a relaxing adults-only pool area gazing onto the Aegean sea, with plenty of scope for people-watching; attentive staff with just the right level of fuss; and a large, modern room with all the extras you’d hope for – such as a hot tub and a sunken bath. Lindos Blu was going to be a hard act to follow. And when it came to booking this year’s hotel, I couldn’t find anywhere that looked quite as good as Lindos Blu. After many hours trawling Tripadvisor (no matter how many excellent reviews there are, I always seem to home in on the negatives: ‘there was a pungent odour emanating from the bathroom… the food was barely edible’), I delivered the news to the husband that we might be heading back to our old friend Lindos Blu. ‘So you’re telling me that out of all the hotels in Europe, you can’t find a single suitable hotel?’ said the husband, with an air of weariness. ‘That’s about the size of it,’ I said. ‘It’s going to have to be Lindos Blu Part 2. We’ll be one of those strange couples who go to the same hotel and ask for the same room every year. ‘Let’s play the wild card,’ said the husband. He thinks people who visit the same place year after year are a bit strange. 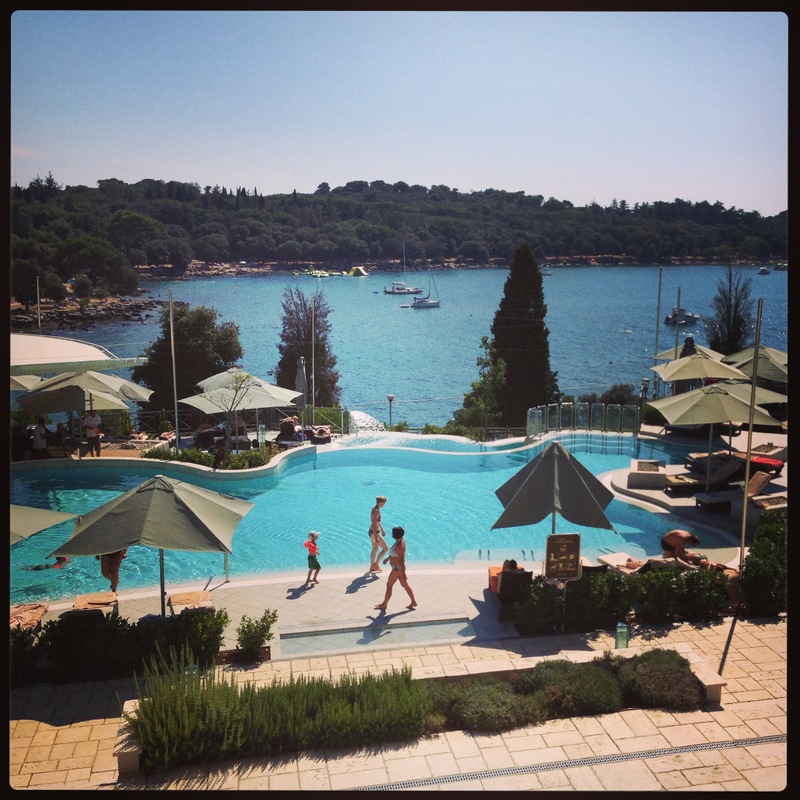 The wild card was a little-known hotel called Monte Mulini, perched atop a quaint harbour town called Rovinj in northern Croatia. It looked lovely. So here we are, gazing out at the Istrian sea, lying on one of our hard-won sun-loungers, cheek to jowl with an uber-boobed Russian nuzzling her catalogue boy lover. It turns out that Rovinj isn’t so ‘little-known’ after all. In fact, half of Europe appears to have descended on the place. When we landed at the hotel yesterday afternoon, it was a beautiful sight… with just one problem: there wasn’t a single sun-lounger free – just scores of bare-breasted women and splashing children as far as the eye could see (okay, so the photo paints a serene scene but on ground level, it was a different story). ‘This would never happen at Lindos Blu,’ I thought. This morning, we rose and headed down for breakfast, passing the pool en route. Already, the hordes had descended, reserving nearly every sun lounger with a carefully-placed magazine or sunhat. ‘This is ridiculous,’ I thought. On principal, I don’t believe in reserving sun loungers pre-breakfast. I blame the Germans. They started this. ‘If you can beat ’em, join ’em,’ said the husband, throwing down his towel on one of the last remaining loungers and placing his Kindle on it territorially. We headed up for breakfast; there wasn’t a single table free. 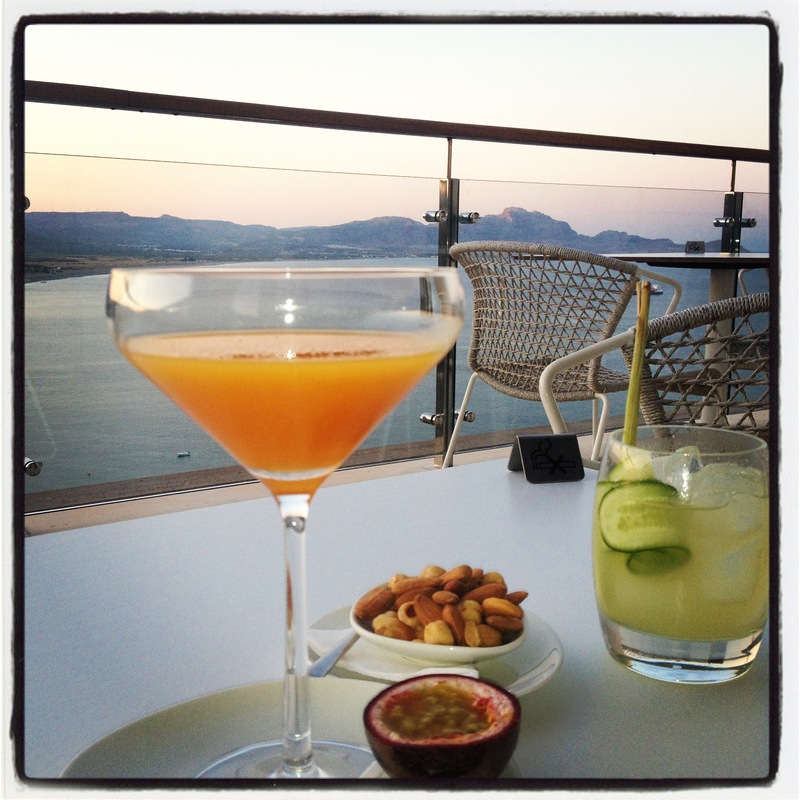 ‘We would never had to queue at Lindos Blu,’ I grumbled. He husband rolled his eyes. ‘And what’s more… I MISS NIGEL!’ I added, dramatically. Nigel was a fellow holiday maker at Lindos Blu last year: a big-bellied booming man with an ego the size of France. He was the very dictionary definition of a ‘bon viveur’, greeting the staff by their first names and regaling his captive audience with tales of far-flung travel destinations. Occasionally, he would dive noisily into the pool and embark on a couple of lengths of butterfly – limbs akimbo – emerging to bellow down the phone at his harassed PA, before continuing his convivial chat with other poolside posers. Basically, he provided hours of entertainment. We pretended that he was the most irritating guest imaginable but when he departed mid-way through the week, he left a big hole in our holiday. ‘We all miss Nigel,’ said the husband wistfully, as he gazed down the snaking line of people awaiting a table for breakfast. And then he uttered the words that neither of us had dared to voice. 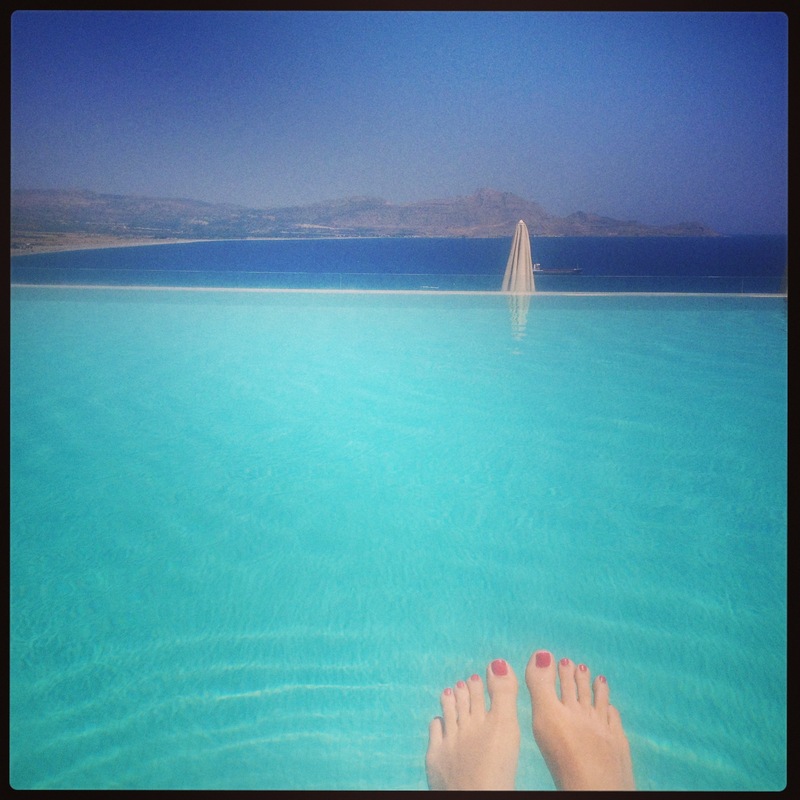 ‘Get me back to Lindos Blu’.